With Thanks to Mark Chapman. An 840 mile solo bike ride to raise awareness of the forthcoming public services cuts starts on 6 May 2011. The route will be from Peterhead to Brighton (8 days of cycling with 1 rest day), going via various public service departments. 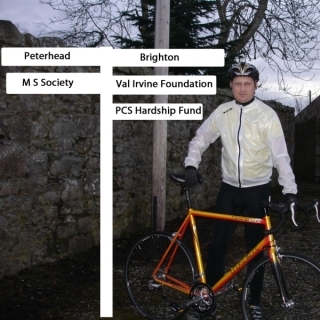 Mark Chapman, Public and Commercial Services Union (PCS) Aberdeen and Inverness Revenue and Customs Branch President, will be undertaking this challenging solo bike ride to raise funds for three causes as well as to highlight the unnecessary cuts that are being made across the UK. Mark will start his ride from outside of the now closed Peterhead tax office (which once employed over 20 local people) on Seagate at 8am on Friday 6 May. On day one Chapman will call at the new Peterhead HMRC location (which now employs just one person), the Aberdeen HMRC office at around 11am, and will finish this first day in Stonehaven. Day 2 – Stonehaven to Perth (calling at Dundee tax office and call centre, and Perth tax office). Day 3 – Perth to Hawick (calling at Cowdenbeath DWP, Galashiels and Hawick tax offices). Day 4 – Hawick to Darlington (calling at Hexham, Bishop Auckland and Darlington tax offices). Day 5 – Darlington to Chesterfield (calling at Catterick MOD, Skipton, Halifax and Chesterfield tax offices). Day 6 – Rest day in Chesterfield (Mark will be meeting with the local Crown Prosecution Service PCS branch members to address a members meeting). Day 7 – Chesterfield to Shipston on Stour (calling at Alfreton DWP and tax office and East Midlands Airport to meet PCS members working for the UK Borders Agency). Day 8 – Shipston on Stour to Salisbury (calling at Newbury tax office, Andover tax office where Mark will be met by the local trades union council, M S Society reps and PCS members, and Salisbury tax office). Day 9 – Salisbury to Brighton (Mark will be welcomed into Brighton at the pier at the end of his ride by PCS members and senior PCS officials). The M S Society – Mark’s mum has been a sufferer for over 20 years and he has grown up seeing just how important it is for the person who has Multiple Sclerosis to have a solid and reliable support network in place. The M S Society provides that support both for the sufferer and their carers. Val Irvine Foundation – Mark wants to help raise the much-needed funds required to allow this new foundation to realise Val Irvine’s dying wish, which was that the studio that she helped build would be used as a holistic therapy and art centre for the people of the Banff and Buchan area who are diagnosed as having cancer – as she herself was only a couple of years ago. Friday 6 May 2011 would have been Val’s 45th birthday, making the start day of Mark’s ride all the more poignant. PCS hardship fund – this trade union is not politically affiliated in any way and they represent members who provide our much-needed public services. They are fighting to stop the cuts in public spending in areas such as teaching, health care, taxation & benefits, and the voluntary sector, as well as protecting jobs in all other public sector departments. “This ride started out as a pipedream really. I’ve always wanted to challenge myself physically and mentally, but I’ve never had the drive to do it just for myself. I started to get really frustrated about the way that the cuts are being portrayed to the general public ,and the fact that they were not being given the full facts to consider. “PCS has published a booklet about the alternative to the cuts, and ideally I felt that this should have landed on everybody’s doorstep across the whole of the UK, but financially that was an impossible task. I decided that maybe I could do something about this by getting the message across in a different way. “PCS conference takes place in Brighton in May this year and I decided that if I could travel to conference in a less than conventional way from the north east of Scotland this year, then maybe I could raise the profile of what the cuts really do mean to everyone in the UK. To sponsor Mark or to find out more about his challenge please visit https://sites.google.com/site/thelongroadtobrighton/ or just type ‘Long Road to Brighton’ into any search engine. To date Mark has received pledges totalling approximately £5,000. Please do all that you can to help him reach his target of raising in excess of £10,000. Mark would be happy to meet people along his route, full details of which will be available on his website. Footnote – PCS, the Public and Commercial Services Union is the union representing civil and public servants in central government. It has more than 315,000 members in over 200 departments and agencies. It also represents workers in parts of government transferred to the private sector. PCS is the UK’s sixth largest union and is affiliated to the TUC. The general secretary is Mark Serwotka and the president Janice Godrich. Royal Mail – Not For Sale!